Once the fog burns off, have a great weekend! Bookends with Astrid's pic today, Ginnie. Ginnie Hart: So, I had to first o look at Astrid's! At least the fog has burned off for her! Ginnie Hart: Thank you, Frank. It's funny how fog can play tricks on us. I love this close up and angle! Wow! This is a bold rendition! Where is Man of LaMancha?? Ginnie Hart: Thank you, Bonnie. In that moment, I think I was that man! I love the drama in this picture and I think the bird is waiting for a spin ... Wonderful silhouette! I like this picture very much, Ginnie. Ginnie Hart: Thank you kindly, Astrid. It's funny but I didn't know the bird was there until I saw this on the big screen. The sun is just about to appear here..
Ginnie Hart: When I first saw the sun, Chris, I thought it was the moon. Seriously. Ginnie Hart: Merci, dear Claudine. Great silhuette! After the heavy storm here yesterday I think we'll have a nice day. Ginnie Hart: We had lots of storm AND sunshine yesterday, Philine. It was a strange day. Oh, I see the little bird, too - very nice! This is not too dissimilar to Bike Friday Ginnie. Both comprise something that goes full circle. I looked this close in photograph very much. Ginnie Hart: Good observation, Chad. Leave it to you to come up with that similarity! Love it! I like the strong silhouette very much. I like the the little bird on the sail. Ginnie Hart: Thank you, kind sir. The little bird came along for the ride without me even knowing it when I snapped the image. Belle ambiance et... comme à la croisée des chemins. Ginnie Hart: Merci, Pascale. I like that...the crossroads. I can't think of any reason whatsoever for not liking this apartf rom the fact that I wish I'd been there to take it. Ginnie Hart: How kind of you, Brian! I love the little bird and your processing! very very dramatic... the windmill almost looks like a scary creature!! Ginnie Hart: Dramatic, indeed, Elaine, and scary in the right situation, maybe. Ginnie Hart: Thank you, Peter, and thank you! Ginnie Hart: Thanks, Tom. Fog always puts me in a "mood!" You have made an excellent picture. I am just waiting for the bird's weight to start up the mill. Ginnie Hart: Thanks, Louis...and I like that idea about the "weight" of the bird. That's power! Joli gros plan sur ce moulin. That's a big perch for such a little birdie. I like your image. Ginnie Hart: I suppose it thought he had found a tree, Jacquelyn??? 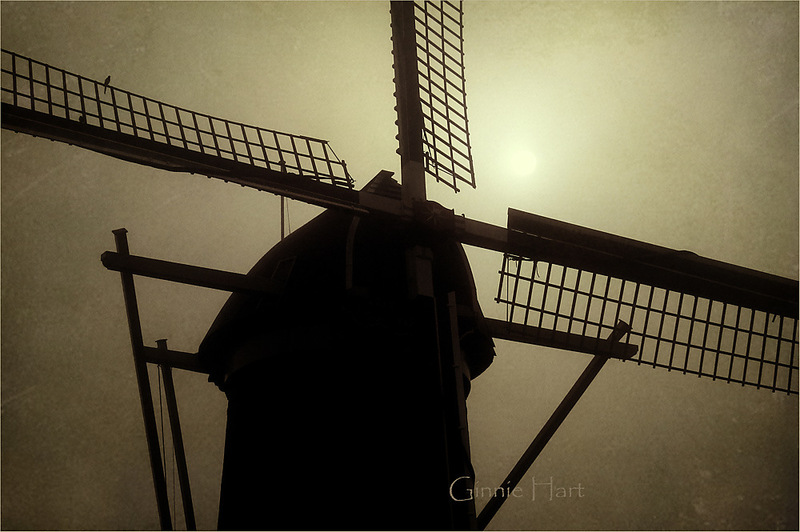 Beautiful close-up silhouette of this windmill! The bird found a nice place to perch. Ginnie Hart: Thank you kindly, Steven. I think the bird thought it was a tree?? Ginnie Hart: Thank you, Anne. Fog knows how to "do it!" I wonder how many birds will it take to turn the windmill? Just got back from Wales. Did a 60-mile cross-country walk there! Ginnie Hart: 60-mile cross-country walk??? WOW, LC. You win the prize! I can just imagine the beauty of what you saw. Enjoy your trip to Malaysia and we'll enjoy ours to America. Looks like we're both going home for awhile?! Ginnie Hart: HA! That's what the fog does, Charles. It can be so mysterious!